Since my crew and I are stuck at home for the holidays (it’s for the best in this case), thought I’d bust out the dye pot and work on my dye notebook. Today’s color exploration is chartreuse. Wish me luck! Just in case I don’t get to check in again before Christmas: May your holidays be merry and bright! “One thing I have struggled with as I’ve been dyeing yarn with acid dyes is how to achieve a particular color I have in my head. 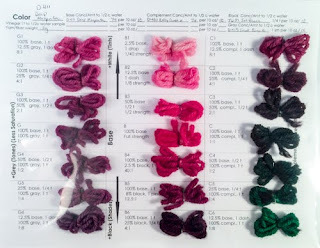 ” a quote from Cari’s article that started my dye experiment tracking journey. I too struggle with being able to make a specific color I want and I hope to help others expand the colors they use in an economical fashion. In my last post you got a peek at my color card samples, using the template cards from Cari’s site. When I started my box of color cards, I wanted a way to be able to take color cards out and visualize them together. As I’ve been exploring color more – I found I needed an easy to repeat way to create particular hues, tints and tones, and an easy way to organize them. So back to a notebook for me. We should be able to create almost any color. I need to be economical about my dyeing projects. Dyes get expensive. There’s only so much space in my little craft area. Few dyes is good space wise. Dye stock only lasts so long. Fewer dyes mixed up on hand, means they’ll get used up before they go bad. If you’re not familiar with CMYK (Cyan, Magenta, Yellow and blacK) here’s a super quick overview. The primaries we were taught in grade school red, yellow and blue – aren’t actually good primaries. They make muddy colors when mixed. They’re from a much older color theory. Modern color theory uses cyan, magenta and yellow for pigments – ask any professional printer. This is for anything that light reflects off of (surfaces like clothes, houses, cars, yarn and fiber, etc). 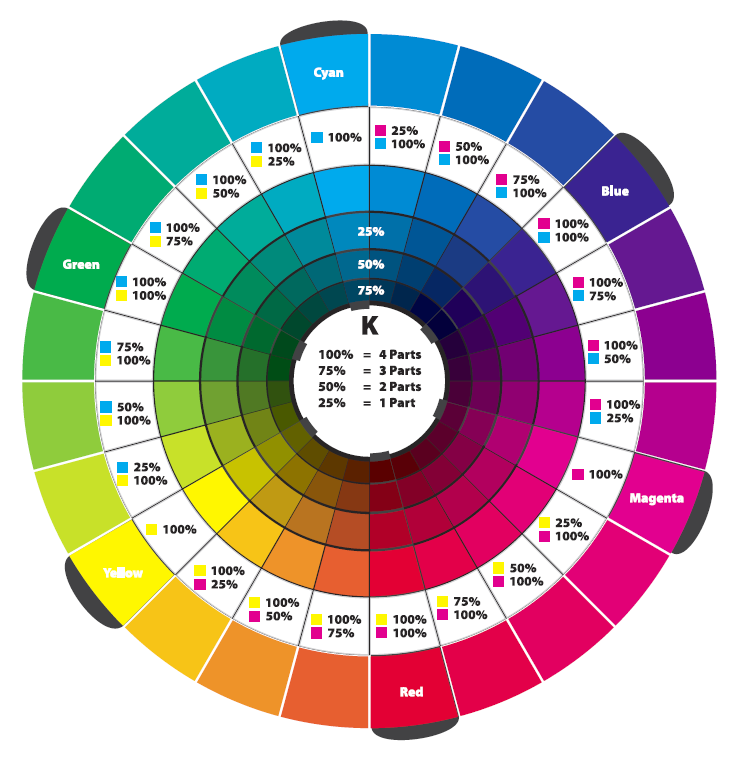 As you can see from the color wheel below – cyan and magenta make blue, magenta and yellow make red, and cyan and yellow make green. Just for fun we’ll talk about light for a moment. Red, Blue and Green are light primaries (for anything that emanates light – light bulbs, flashlights, lasers, computer screens, etc.). Before I started this project, I tended to think of the color wheel as a static thing – almost like scientific law. But it’s a man made creation with different interpretations. You’ll see all sorts of variants on it depending on what the color wheel was representing and who created it. The one above is my favorite so far because it uses CMYK and yellow has a bigger color spread than on many other representations. Having too rely on my computer and Photoshop for every color was getting pretty tedious and too random for my needs. I needed a system that I could run with, instead of trying to create colors here and there. I also wanted a good feel for how the dyes work together. Random colors here and there would not help me with this understanding. 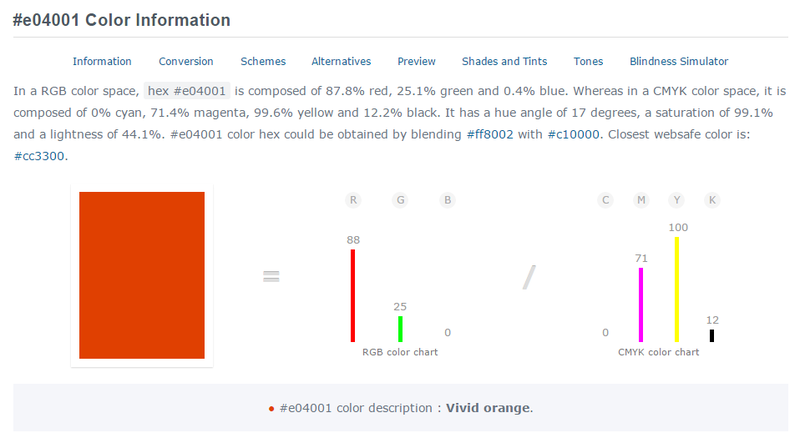 CYMK percentages were created for pigment inks. Acid dyes are different. Pigment inks are opaque. Acid dyes are more like water colors. They are transparent and can be layered for wonderful effects. This makes light colors like yellow very easily over powered by darker colors like magenta and cyan. (I found my yellow to be ~½ as poweful as my magenta and ~¼ as powerful as my cyan.) It really messed up playing with CYMK formulas. I only bring it up, because I’d mentioned it in the last article. It was a fun idea, but looking at the color wheel and going from there is proving to be a much more logical approach. Starting with my primary colors of cyan, magenta and yellow – I started to build my dye color book from the color wheel. After the primaries I went to the secondaries. These are the colors you can mix with the primaries. For example: cyan and yellow make green. So green is a secondary color. And from there I mix colors in between the primaries and secondaries. That being said, I find browns and other complex colors (where you’re mixing more than 2 dye colors together) to be the most tricky with just cyan, magenta, yellow and black because some dyes strike faster than others. My yellow and black dye strikes very fast and my red and cyan take much longer. If I am not extremely patient for the slower dyes to strike, I get some very ugly browns. When I saw Pantone just came out with a CYMK + OGV (Orange Green and Violet) palette set, it made me think. Adding 3 extra colors to my set of dyes wouldn’t be a big deal and it would help with the long processing time issue with browns being mixed from more than 2 dyes. I could get browns with variations on an orange and have a faster processing time. 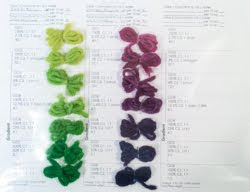 So after comparing colors, I ordered 3 more dyes. Now I have 7 base dyes to play with (+ a few others I had before the project began). My seven dyes are cyan, magenta, yellow, black, orange, green and violet. For my samples I dye a set of variations of 1 or 2 colors to see how they react – in sets of 7 (because that’s how many little jars I can fit in my dye pot). 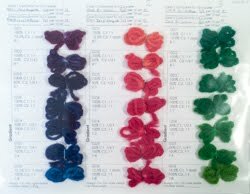 I created a dye sheet with repeatable measurements and ratios so I can create the colors again easily. To explore a single dye color I mix light to dark with that color (middle row below), mix the color with gray (left below), and mix the color with it’s complement or a color close to the complement (right below). While that covers many colors, 21 at a time – it doesn’t help me find out how mixing say magenta and yellow together gets the best red. So I made two gradient exploration pages. One is where vary I the two dye colors. If both are strong colors (i.e. not a light color like yellow) this works well. The other is where I leave the first color at full strength and vary the second. This is good for light colors like yellow or pink. Starting by adding a drop of a dark strong color to a light color helps see more variation in the change of the lighter color. So there you have my process for color mixing and exploration for my dye notebook. I hope it’s of help to my fellow dyers in expanding your color choices for dyes and being able to do so on a budget. Next post I’ll share the nalbinding projects I’ve been working on. As much as I love playing with dyes, I’m working on other crafts – really! Have you put together a dye notebook? What kind of notes do you keep? Do you use a formulaic way to explore color or is it more random?